Amy finished the tote she was going to make for me using the Moda Glace fabrics I bought at the quilt shop in Sumter a couple weeks ago. I couldn't believe how fast she finished it! It turned out beautiful!! I'm so happy with it. She also made me a little zip bag and it turned out so sweet! I love them both! Amy has a couple more totes she's going to be selling (in different colorways, but just as cute). Contact her for more info. I worked on block #1 of CaHRH on Friday and a little bit yesterday. I got the peacock's body done. That was easy... it's all the feathers with the tons of color changes that's driving me nuts! I hope to work on it a little more today - in between laundry, dishes and all that other fun stuff! Write soon! I love the tote and zip bag Amy made for you! So beautiful! Wonderful choice of fabrics. And your CaHRH! You're almost done! How great is that?! Can't wait to see a happy dance finish! Lucky you! Amy did a wonderful job! 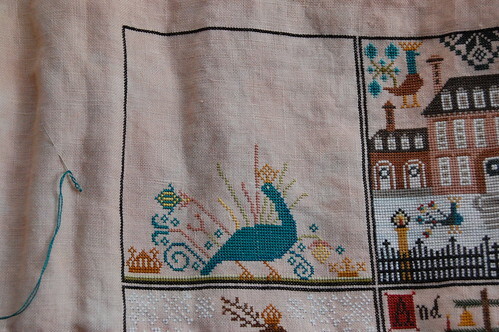 I feel a big Happy Dance coming on from your stitching room soon! Oh Nicole - you're so close to finishing CHRH! Sorry about all the color changes though - those can really drive you bats! Love the beautiful things from Amy - she did a wonderful job on everything! Nice start on Token. What thread are you using for it? I love that color of red. Gorgeous!! Love the tote and your stitching is great - you're almost there! The tote, zip bag and Q-snap cover all look fabulous! Lucky you to have a friend who will sew for you. As I've said before... your CaHRH is fantastic. I love your new bags, the colors are fantastic. And I have to share! 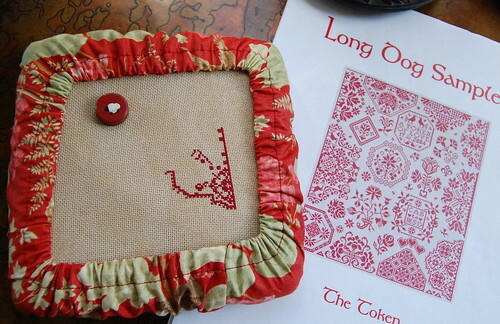 I'm so excited, I just received in the mail ChaHRH with the NPIs & the 40ct linen. This is my first time working on 40ct, but your ChaHRH has been such an inspiration I just have to try. Oh my goodness that is cute!!! I love it--the tote, the smaller piece, the qsnap cover, your new start... wow. CaHRH looks fab, too. YGG! The bag is absolutely fantastic! 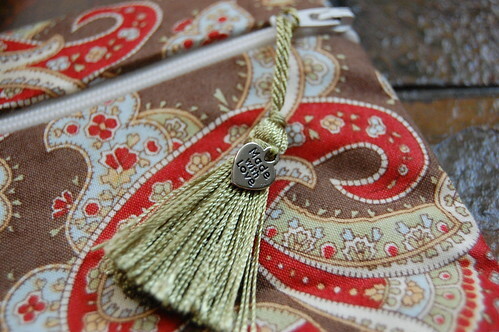 OMG Nicole...that is so pretty and I love the little pouch in the brown paisley. Too cute!! Amy said you showed restraint at the quilt store too...good girl! Can't wait to see the finished Hawks...you are so close. Great job. 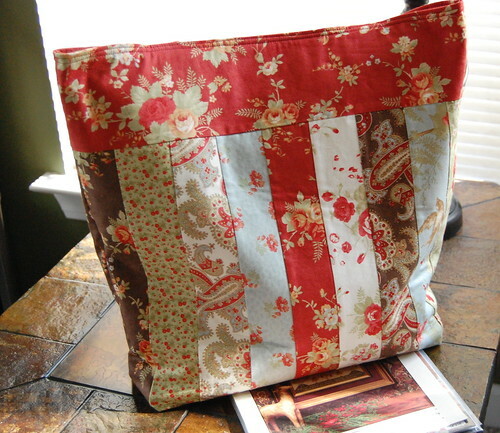 Your tote and matching zip bag are beautiful - wonderful selection of fabrics. CaHRH is coming along nicely and quickly. What a beautiful gift from Amy! The fabrics are gorgeous. Great job on CaHRH, you'll be done in no time - cant wait to see it! You are going great guns on this. I love it! I finally finished the bkgrd on #11. Yippee! for me. Amy's bag is beautiful - what a nice job she did. Love, love, love the tote bag and zipper bag! 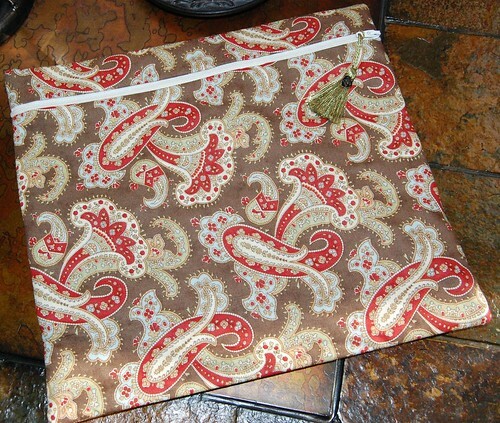 I used Glace' to make a couple of boxes and just love that fabric line! Adore your peacock that is coming to shape! Great going on CaHRH, how exciting! What fun, and what a gorgeous tote and little bag! Amy is so talented! (I was checking out the awesome zipper application!) You're so close on CaHRH! Love the paisley zip tote! What lovely presents! And you are so close to being done your CAHRH I'm jealous! I can't wait to see your finished piece. Hi Nicole I am so glad you have a great time at Amy's and the bag that she made you is really bea utiful! Your Christmas at Hawk Run Hollow is so pretty and colorful and your stitches are so lovely and uniform! You are almost done it looks like! Wow what an accomplishment!! I love your bag and your little zip bag too!! What fun fabrics you chose. Now, I want one!!! And CAHRH is looking amazing - you'll be done before you know it! Love your new tote. Sounds like a fun day! CaHRH is gorgeous. 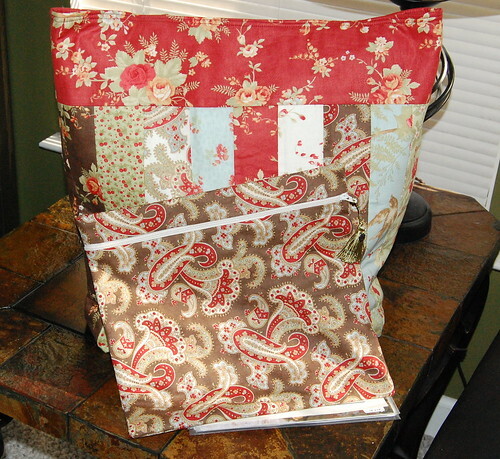 Wonderful bag - love those Moda fabrics! You can never have too many bags to haul stash in LOL. You are such a fast stitcher - can't believe you are almost done with CoHRH already! I'm envious! I'm playing catch-up with my blog reading - the tote that Amy made you is cute, and I really like the little zippered pouch, too!